Peace of mind with an easy closing gate. 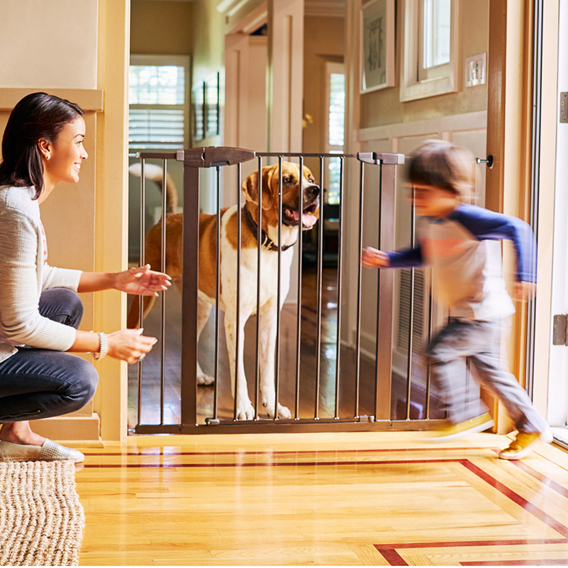 This gate, made especially for parents seeking added peace of mind and versatility is perfectly suited for stairways and wide openings. Made from strong steel material, this gate provides ultimate durability and strength. Safe for use anywhere in the home, this hardware-mounted baby gate stands 29" tall and fits openings 51"-56" wide. NEVER use with a child able to climb over or dislodge gate or enclosure. To prevent serious injury or death, securely install gate or enclosure and use according to manufacturer's instructions.